The 40-pages rulebook included allows players to easily customize the game according to their preferences and experience. A wealth of optional rules is included, each of them referring to the â€œlevelâ€� of the rules they can be used with, so that itâ€™s easy to expand the game, no matter which is the complexity of the rules set you like to play with. Among the Optional Rules, probably the most important addition of this pack is the set of Ace Rules. When using these rules, each pilot may have ace status, be a normal pilot, or be a rookie. Each ace may have one or more special skills, which each player may freely choose. A lot of different skills are includedâ€¦ Acrobatic Pilot, Daredevil, Height Control, Good at Escaping, Lucky Pilot, Chivalrous Aptitude, Strong Constitution, Super Ace, Bullet Checker, Incendiary Bullets, Technical Eye, Itchy Trigger Finger, Perfect Aim, and Sniper. Beside the rulebook, the pack includes a number of game materials. There are four decks of Damage Cards (A, B, C and D), 6 Target/AA Machine Gun cards, 6 Trench/AA Machine Gun cards, 6 Trench/AA Gun and 5 Bomb cards. Four airplane consoles are presented (dual sided for use with either the Basic or Standard/Advanced rules), two rulers for determining range and 163 markers, tokens and counters, to handle special damage, ace abilities, manage altitude, keep track of your airplane status (damage to the crew, last maneuver takenâ€¦), and more. 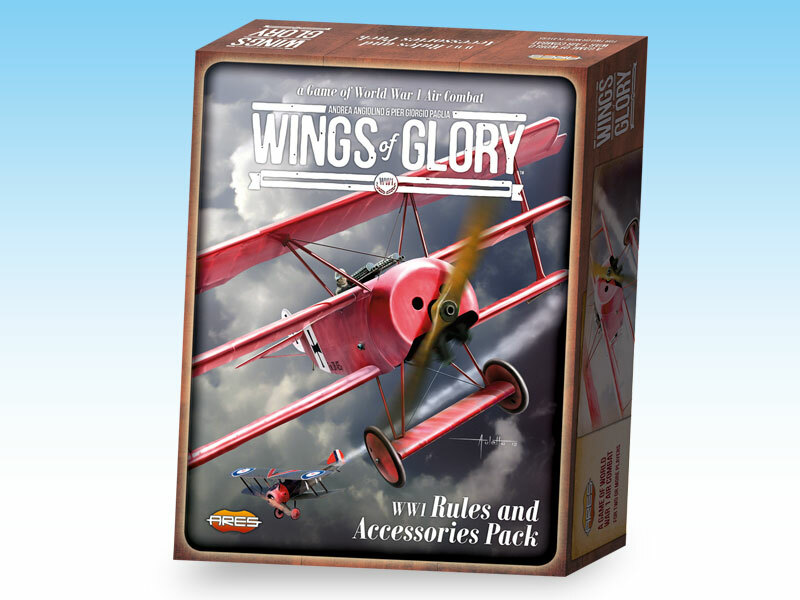 The WW1 Rules and Accessories Pack is the most complete rulebook to date for the WW1 Wings of Glory game system, with a logical structure for reading and learning the rules, and recommended to people wanting to get start in the game, as well to â€œveteransâ€� interested in using the miniatures they already own with the new rules and models.